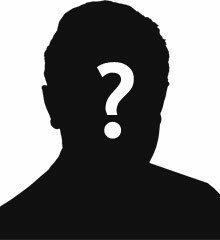 Patrick Gartland was the son of Michael and Mary Gartland of Brackaville, Coalisland, County Tyrone. The 1901 census records that Michael was a labourer. By 1911 Patrick’s father had become a postman. Patrick was a 14 year old linen weaver. 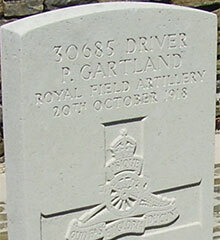 Driver Patrick Gartland was serving with the Small Arms Division, Ammunition Col. of the Royal Field Artillery when he was killed on 20th October 1918. He was aged 22. St. Vaast is a village approximately 13 kilometres east of Cambrai on the D942 towards Solesnes. The Cemetery lies within the Communal Cemetery which is on the left hand side of the road before entering the village from Cambrai. 3 War Graves Photographic Project Photo of Patrick Gartland's headstone can be purchased here.